Marc Marquez (Repsol Honda Team) heads the grid again for Sunday’s sixth race of the year, at the Gran Premio d’Italia in Mugello, with Andrea Iannone (Pramac Racing) and Jorge Lorenzo (Movistar Yamaha MotoGP) also featuring on the front row. A 1’47.270 lap gave Marquez his sixth consecutive pole this year and his seventh successive top grid spot including Valencia last year, as his perfect form continues. An excellent effort from Iannone (+0.18s) saw him show his pace again to get his first premier class front row start, the perfect response to his two recent DNF results and an ideal performance from an Italian rider on an Italian bike at the Gran Premio d’Italia TIM. 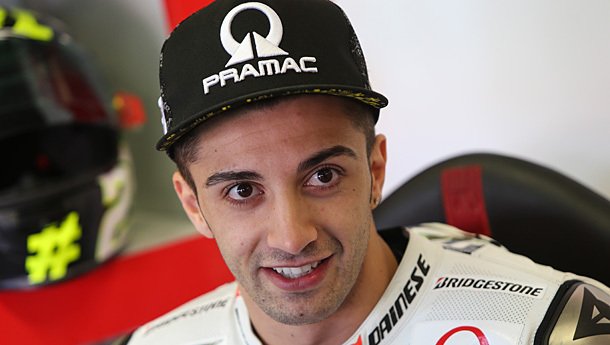 Andrea Iannone: “I am very happy for my first time on the front row in MotoGP. It wasn’t easy. I want to thank Ducati, because on the straight the bike is incredible. But I pushed very hard with the first soft tyre and this is where I got my best time. I’m happy!” said Iannone. Lorenzo got his third row one result of the year in third place, meanwhile, as he lapped a quarter of a second off Marquez. 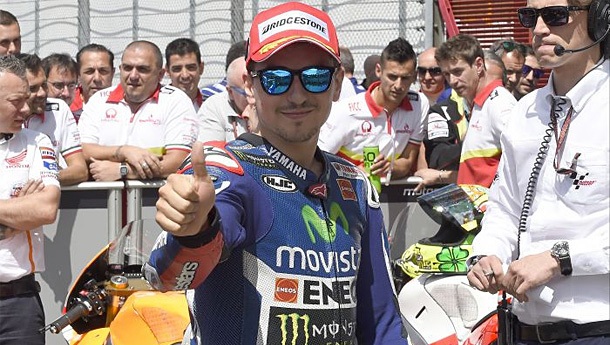 Jorge Lorenzo – he’s happy to be back on the front row. 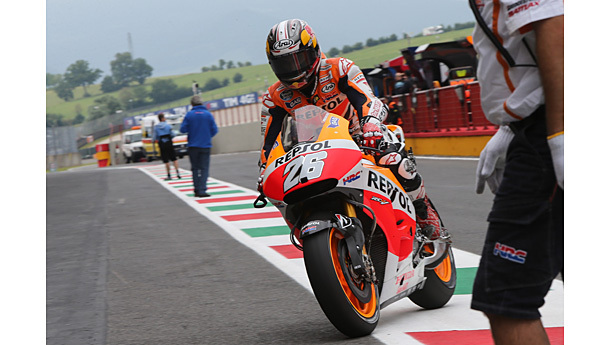 Dani Pedrosa (Repsol Honda) still holds the pole record at Mugello with his 1’47.157s time from last year – and he qualified in fourth position with a late lap 0.314s from today’s pole. A big crash on an out lap ended Monster Yamaha Tech3 rider Pol Espargaro’s session early as he went down at turn nine and was clearly annoyed, but the Spaniard was unhurt and still ended up fifth on the grid. 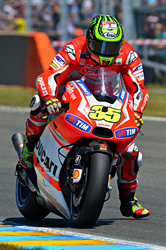 A good qualifying result for Cal Crutchlow (Ducati Team) in sixth saw him outperform team-mate Andrea Dovizioso who was eighth. Either side of Dovizioso on the third row are Bradley Smith (Monster Yamaha Tech3) and Stefan Bradl (LCR Honda MotoGP) in seventh and ninth places respectively, with all three qualifying within 0.5s of pole. Valentino Rossi (Movistar Yamaha MotoGP) did not get the Q2 result he wanted as he qualified down in 10th for his 300th Grand Prix race. Alvaro Bautista (GO&FUN Honda Gresini) and Aleix Espargaro (NGM Forward Racing) made it through from Q1 but were ultimately 11th and 12th. Jules Danilo (Ambrogio Racing) had a big high side at Turn 8 but was not harmed in the crash. Moto3 qualifying at Mugello ended with Alex Rins (Estrella Galicia 0,0) outperforming the rest of the field at the picturesque Mugello track, with Jack Miller (Red Bull KTM Ajo) and Jakub Kornfeil (Calvo Team) joining him on the front row. 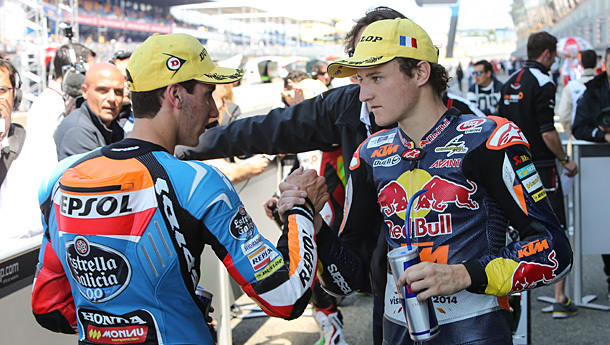 Alex Rins and Jack Miller – Round 5 Le Mans. Rins lost the front at turn 2 and crashed just after setting a new Moto3 Mugello pole record time of 1’56.999, later rejoining the session having rushed back to his box after the incident. Championship leader Miller as just over 0.25s behind the Spaniard in second place, whilst a late improvement from Kornfeil left him 0.327s adrift of Rins in third – for his first ever front row GP start. Row two, meanwhile, comprises home rider Romano Fenati (SKY Racing Team VR46), the experienced Alexis Masbou (Ongetta-Rivacold) and the ever-improving Alex Marquez (Estrella Galicia 0,0). Rookie Karel Hanika (Red Bull KTM Ajo) got his best grid slot to date in seventh, ahead of Juanfran Guevara (Mapfre Aspar Team Moto3) and Brad Binder (Ambrogio Racing) on the third row. Efren Vazquez (SAXOPRINT RTG) completed the top ten. Michael Esdaile on Wayne – In cinemas now!